To see the begin of this history click here. On December 20th 2017, I've received an e-mail from PMI with the subject: PMP® EXAM CHANGES — 26 MARCH 2018 — ARE YOU READY? Submit your payment for your PMP exam today, then schedule your exam before 26 March 2018 to test on content in A Guide to the Project Management Body of Knowledge (PMBOK® Guide) — Fifth Edition. On 26 March, the exam will change to include new content from the PMBOK® Guide — Sixth Edition. Test centers are filling up fast. The sooner you submit your exam payment, the more likely you will be able to test at the center closest to you at a time that best fits your schedule. 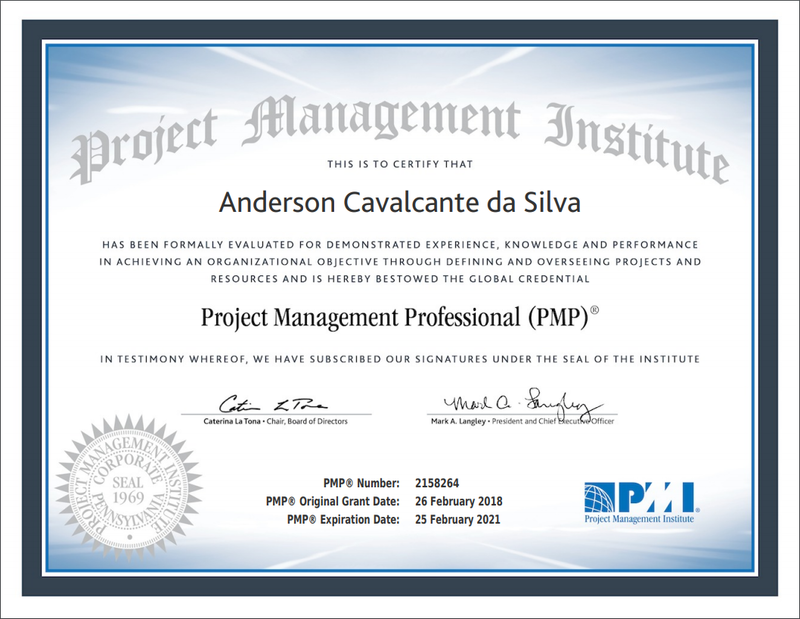 After have study for a long time and fail, the thoughts about the PMP certification my mind were: “You can’t do it, man. You have failed already. Why don't you try to do something different!”. Man, my father became a doctor after he tried for 5 years to enter in a college of medicine. You’re young, smart and the most important: you want it! Just do it! Nothing is impossible! From December 2017 to February 2018 I opened both books every single day for studying. Somedays I’ve studied more than 5 hours 🤓. On the weekends, after studying for at least 2 hours I used to open the PM FASTrack® — PMP® Exam Simulator and did the exam simulation for 4 hours. 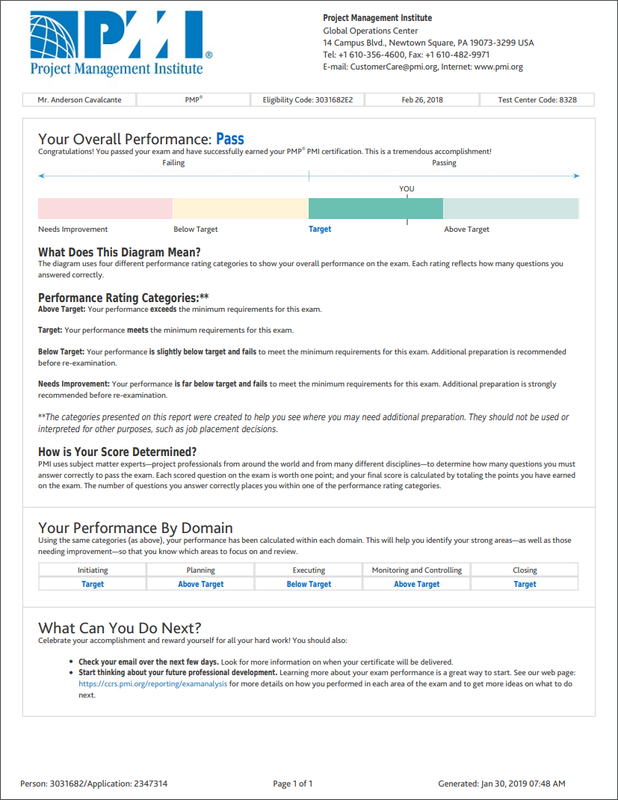 Afterward, I got the result report and I decided to analyse my own results in details. Therefore, I’ve realised that I had a low score in some Project Management Process Group and Knowledge Areas. So, I started to study these points and I understood the mistakes I’ve made. Also, I’ve used the website www.PMTotal.com.br to try the exam with another questions, because sometimes I was seeing the same ones 🙃. This website is amazing! You can do the exam with 20, 50, 100 or 200 questions. But it is only in Portuguese, though. Wonderfully my results start to raise and each day I felt more confident and I was proud of myself 🤩. On January 28th 2018 (3 days after my birthday), I've submitted the payment ($180) to reschedule my PMP exam to February 26th 2018 at 01:30 pm. The fateful day has come (again) 😬 and I went to the same place to do the exam. After a detailed search, even with a metal detector, and to have all the restrictions explained by the staff, finally I got to the room. I felt relaxed during the exam and I drove the exam in the same way. For each hour I had to answer 50 questions. In the first hour, I’ve answered 13 questions more than expected. In the second one, I’ve answered 127 questions (over 27 than I’ve planned) and I felt confident. I finished the entire exam in 3 hours and 20 minutes, and I used the remaining time to review the maximum questions. Time was out and I clicked at the “Submit exam” button. I did so and the message “Are you sure?” came to my screen and at this time I laughed that situation differently than the 1st exam that I’ve done. And with a smile on my face, I clicked at the “YES” button. Again, the system started to process all the answers and in this meantime, the software showed me feedback questions and I answered all of them. I wanted to make noise at the room, but I remember that this could revoke my certification 😂. Then, I’ve decided to keep calm and go to the Prometric assistant’s room and got my result report.